Scientists use a range of methods to understand what raptors - birds that feed on smaller animals - eat. These include collecting and identifying prey remains from nest sites, inspecting pellets, which are regurgitated balls of indigestible prey parts, watching from hides set up at nests, or using remote technology such as placing camera traps at nests. Scientists can now even analyse the chemical properties, like stable isotopes in feathers to describe the types of prey eaten. These approaches are incredibly valuable in assessing diet. Unfortunately, they present some limitations. Almost all are nest based. This limits them to the breeding season and prey that is brought to - and remains at - the nest. 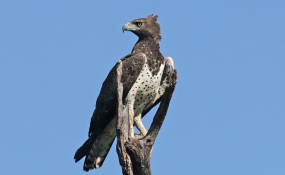 Martial Eagles also nest at really low densities. To get diet data from nests, researchers visit multiple sites in remote places and many times per season. This makes these studies challenging and expensive.